what do you mean by the plain black, what we have right now, or just black, because i changed some stuff. cool, yeah i put it up, though it took me a while to tone down how bright it was, no one would have been able to read anything with how bright it used to be. Yeah there's more of an are covered in #1. Also, if you say there is a Star Wars beta template, that might be cool. It would definitely be appropriate for this site. 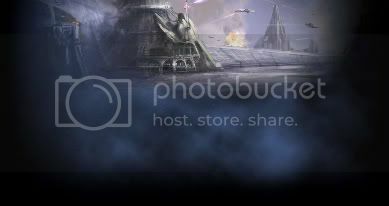 it does not have the background, but has the widget headers that we have now, so I just edited the template the star wars template and made it look 5000x cooler.